To say that dreaming is work is of course not to refer it to capitalist structures of labor exchange, but to stress that committed projects of imagination require critical investigations into current material conditions in order to identify what potentials exist and what requires change. Far from being fanciful, abstract, or reified, strong and grounded alternative visions for our future are needed today more than ever, particularly to face the mounting exigencies posed by the climate crisis. How might, then, an engagement with a utopian imaginary at this moment invert the conventional dichotomy that posits the utopian as an abstracted, removed “no-place” as opposed to “practical” architecture? It would seem that under the politics of the new climactic regime,⁴ environmental utopias (a slight redundancy as we would claim that all utopian thought today cannot ignore the environmental) instead become that which is grounded, material, and terrestrial. By contrast, to pretend that architecture can continue on its present course with its usual assumptions for practice and design has rather become the outlook that is detached from the reality of the Earth. A “business as usual” attitude becomes instead that which is fanciful, abstract, and willfully ignorant. Can utopian projections avoid these pitfalls? We, the editors, think yes. Where we see hope in the utopian spirit is in its capacity to imagine alternate futures and value systems, outside of the insidious framework of capitalist utilitarianism. See Alejandro Duran’s article which ruminates on what an embedded architectural practice might look like. See Maya Sorabjee’s article on World Class Utopias. See Rosa McElheny’s article describing Paul Kagan’s photographs of utopian communities under construction. Here we draw on Bruno Latour’s reformulation of the poles of politics as no longer between Left and Right, but Modern and Terrestrial; see Down to Earth: Politics in the New Climatic Regime (Polity 2018). 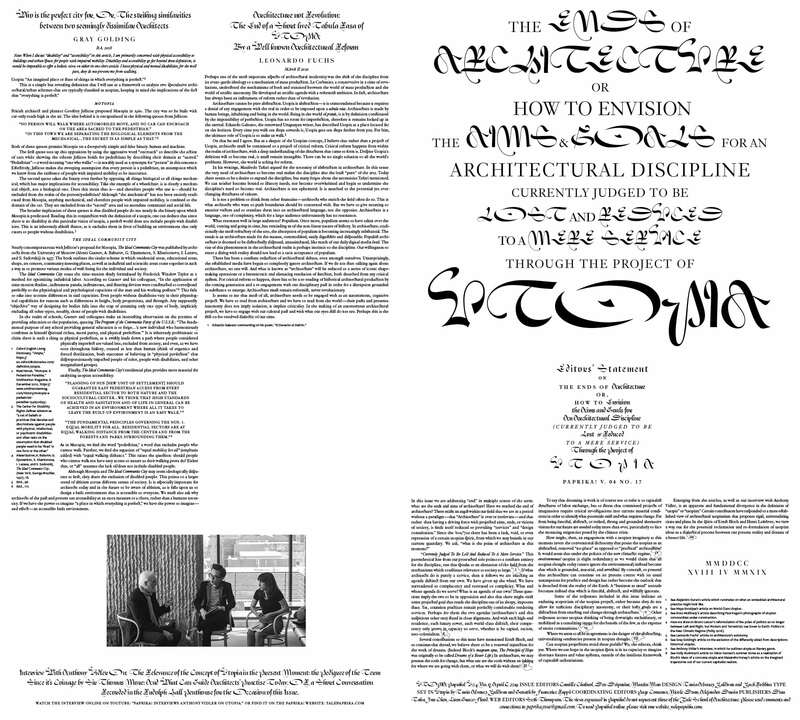 See Leonardo Fuchs’ article on architecture’s autonomy. See Gray Golding’s article on the exclusion of the differently abled from descriptions historical utopias. See Anthony Vidler’s interview, in which he outlines utopia as literary genre. See Holly Bushman’s article on Oskar Hansen’s summer home as a realization of Bloch’s ideas of a concrete utopia and Alexandre Honey’s article on the imagined trajectories out of our current capitalist realism.